Sep 28, 2018 @ 03:41 PM — by Retina Associates, P.A. The eye can take in and process thousands of images on a daily basis. All of this happens nearly instantaneously, so many people rarely stop to consider what goes into creating a clear, focused image. The eye is actually made up of multiple parts and layers that all play an important role in producing clear vision. Understanding how the eye works helps our Kansas City, MO patients understand how the vision can be negatively impacted by retinal conditions that disrupt the function of the light-sensitive cells at the back of the eye. Here, the team at Retina Associates, P. A. goes over the complex process that occurs every time the eye takes in light. A healthy eye receives, focuses, and processes light and images so quickly that it feels like a seamless process. However, what goes on behind the scenes is surprisingly complex. Light needs to pass through each layer of the eye before a clear image can be processed by the brain. In reality, the way the eye and brain produce an image is similar to the way a camera captures an image. 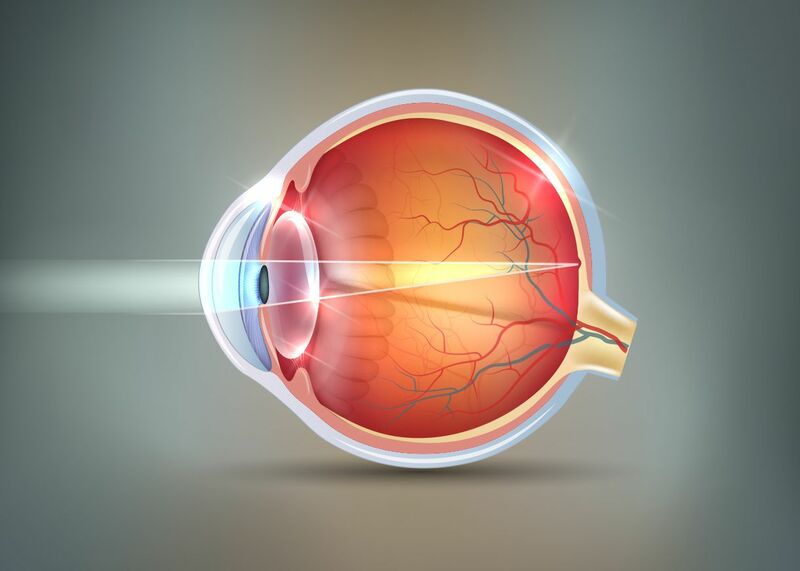 Light enters the eye through the cornea, the clear layer of tissues at the front of the eye. As light enters the front of the eye, the cornea bends the light so that it can pass freely through the pupil of the eye. As light passes through the pupil of the eye (the dark opening in the center of the iris), the pupil shrinks or enlarges, much like a camera shutter, so that the appropriate amount of light can enter the eye. After passing through the pupil, light reaches the lens of the eye. The lens is a clear, flexible layer of tissues that can adjust its width as necessary to properly focus light. Once light is through the lens it reaches the retina, which is a collection of light-sensitive nerves and tissues at the back of the eye. The retina takes light rays and turns them into light impulses that can be sent to the optic nerve. The optic nerve carries light impulses to the brain, where an image is created. All of the parts within the eye rely on each other to create clear, focused images. If a patient suffers from any eye conditions that affect the cornea, lens, or retina, vision will be negatively impacted. Each eye disease affects the eyes in its own unique way. Possible side effects include discomfort, glares and halos, double vision, cloudiness, and general blurriness. Any patient who experiences a sudden change in vision should schedule a comprehensive eye exam as soon as possible. Often, early diagnosis and treatment are key to preventing permanent damage to the eyes and vision. The specialists at Retina Associates, P.A. offer a comprehensive range of eye care services and are happy to customize a treatment plan based on each patient’s unique needs. If you are concerned about the health of your eyes, it is important to work with an experienced eye care specialist, such as those at Retina Associates, P.A. Contact us at your earliest convenience to learn more about our comprehensive range of retinal treatments, or call (816) 505-3400 to set up a personal consultation.